Do You Need A Quick Tattoo Cover Up? Tattoos are personal and meaningful to the bearer. Most ink represents a special person, a special event, or a special interest. There are times, no matter how beautiful or sentimental the tattoo is, it needs to be covered up. When (not if) this occurs, the easy method of cover up is via sleeves and other clothing. For many tattoo sites, this works, but if the tattoo is in a highly visible location, this method doesn’t always work. If you love your tattoo but just need it to disappear for a special day, it’s not a problem! Tattoos, or other blemishes can be made temporarily invisible. This is ideal when unwanted tattoos need to be covered up for weddings, formals, dinner parties and other special events. Our trained staff can color match your skin tone and make your skin appear flawless. 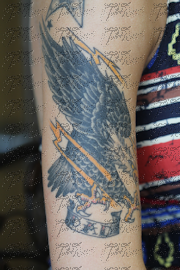 With state of the art airbrush technology, a super fine mist of water proof cover up is applied over the tattoo and will last for up to 24 hours at a time. When temporary tattoo cover up is desired, the best method is with makeup. Traditional makeup that is rubbed on to the skin can appear blotchy and uneven. Many times it is difficult to find a good makeup color that blends well with your natural skin tone. Popular self-applied facial makeup doesn’t work because of the need for a smooth skin surface coverage. Airbrushed tattoo cover up makeup is the preferred medium. Of course, not all tattoo coverup makeup is the same, so when considering a tattoo cover up service, it is important to stay on the lookout for a few items and specifications which are designed to make the cover up process more successful. First, you want tattoo cover up makeup to be water proof. The last thing you want is to be outside during a big social event and have it start raining, thus exposing your tattoo. You are covering up the tattoo for a reason, and having it completely, or partially, exposed to everyone attending the event might be extremely awkward. Outside of having the tattoo cover up makeup water proof, you need to check to see just how long the cover up makeup lasts. Some cover up makeup rubs off gradually, similar to a spray tan. The more you exfoliate the faster the coverup makeup comes off. Chances are you only need the makeup cover up in place for a single day or even a few hours, so it shouldn’t be a problem to have it removed from your body in a matter of days. You do need to check to see if the coverup makeup rubs off. Some spray on material actually does rub off on clothing, especially if the individual is perspiring when the makeup is applied. This causes the skin to sweat, which in turn causes the makeup to rub off onto any clothing worn. Not only does this expose the tattoo faster than it should, it also stains the clothing, and if the clothing is a rental, this may end up costing you a good amount of additional money in order to clean and dry clean the clothing. One thing is for sure, avoid purchasing any self-applied tattoo cover up makeup from the local grocery store or drug store. This makeup, although it may sound like a great deal, is cheaper than an airbrush service. There is no denying that. However, it does not provided the desire results you’d receive from the professional airbrush service. What sets an airbrush service part from the self applied makeups is the fact the airbrush is specifically designed and tailored to meet your skin tone, not just a run of the mill, one size fits all kind of deal, which is exactly what the self applied makeup is. This means the store purchased tattoo cover up makeup is not going to fit your skin tone properly, and result in a very odd looking cover up. Even if the makeup is water proof and capable of covering up the tattoo, it is not going to perfectly match the same tone of your own skin, resulting in an odd off-color smear along the border of the tattoo. If you have ever seen someone who has used self-applied tanning lotion before, you’ve probably seen where they applied too much and other locations where they applied not enough, resulting in a very obvious, off skin tone color. Professionally applied tattoo makeup does cost a bit more than the other services, but it results in the best looking cover up money can buy. And when it is important to look your best, it is the only option available for you. There is no pain to it and the appellation process only takes a few minutes to perform, allowing you to spend much more time working on the event and prepping yourself. So whether it is your wedding or your first big meeting in a long time, it is essential for you to look and feel your best. With the help of tattoo cover up makeup, you don’t have to worry about anyone staring at you uncomfortably, as the tattoos, which you may love but others may look down upon, are covered up. So take advantage of the airbrush tattoo cover up service, you’ll be glad you did and nobody will ever know you used the service, outside of those who already knew you had a visible tattoo. We provide this service in our office or we can come to you. Call us to schedule an appointment or discuss your needs at (281) 685-9998. What Is the Cost of Tattoo Cover Up? Call us for other tattoo cover up quotes. -We have the best prices, period! 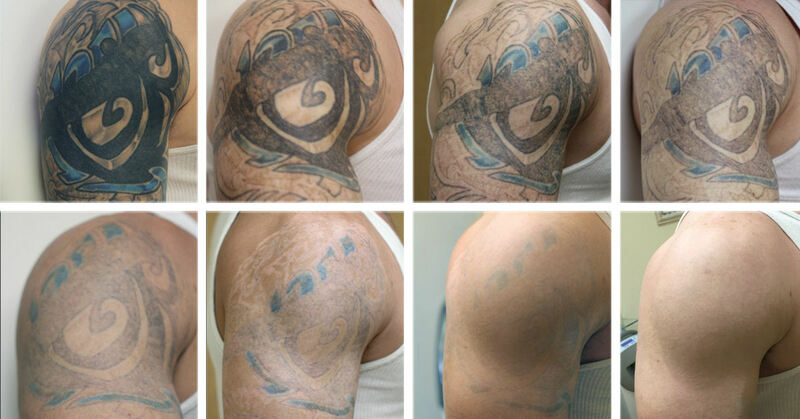 No need to over pay somewhere else when you can receive the best laser tattoo removal services at the lowest price! Check out our package deals.